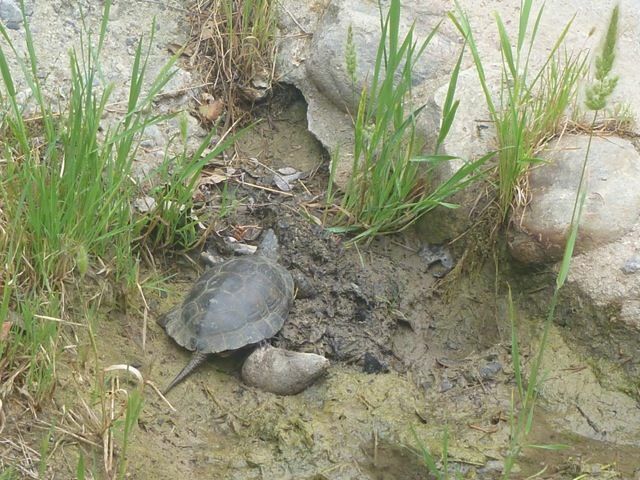 Topanga's Turtles are feeling the heat and need your help. As the temperatures continue to hover over 90oF, our local native western pond turtle neighbors are searching for refuge. This summer marks the fourth year in a row that the main turtle pond has been dry, and the small refugia pools are dropping fast. Thanks to a wonderful group of volunteers, last fall we were able to hand carry 200 gallons of water per week almost half a mile to keep the refugia pools going, but they were already low again by May 2015. Since August 2014, we have found over 50 dead turtles. This is a very large percentage of the 350 individuals we have tagged since 2002. Most appear to have died of starvation, as they can only feed when in the water. We need your help! Please read on to hear more about the turtle's plight and to see some incredible photos. To donate volunteer time, supplies or a temporary pond location, call Rosi at 818-597-8630, or send a tax deductible donation to: RCDSMM, 540 S. Topanga Canyon Blvd., Topanga, CA 90290. Be sure to note it is for the Turtle Fund. Thankyou! Come to a special workshop hosted by Los Angeles County Supervisor Sheila Kuehl, the Topanga Town Council and the Topanga Canyon Watershed Committee on water conservation ideas and workable greywater systems. Learn ways to add years of life to your septic by conserving water and finding greyline solutions that work best for you. Learn which systems are to be done with a permit and those that don't require one. 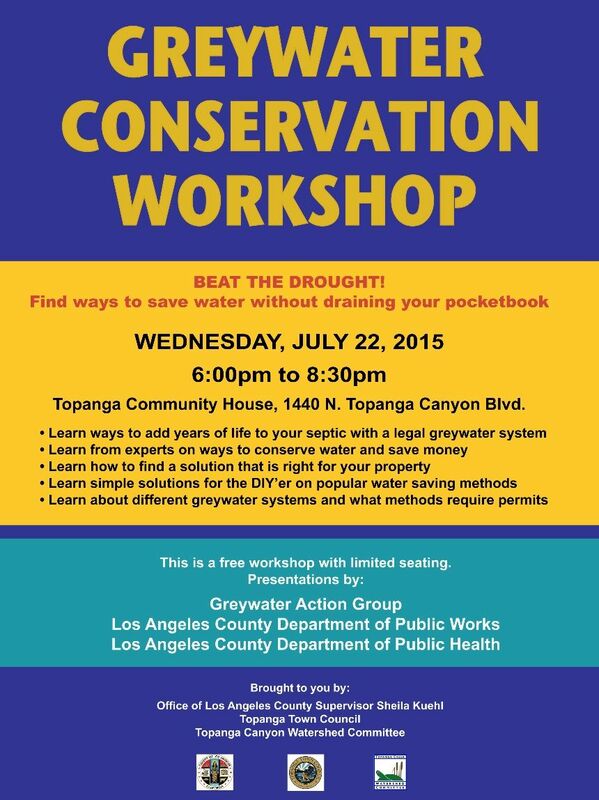 Talk to the experts from the Greywater Action Group, Los Angeles County Department of Public Works and Public Health. Seating is limited, so come early! Los Angeles is subject to hot weather, high winds, dryness and overgrowth, which create fire hazards when combined. 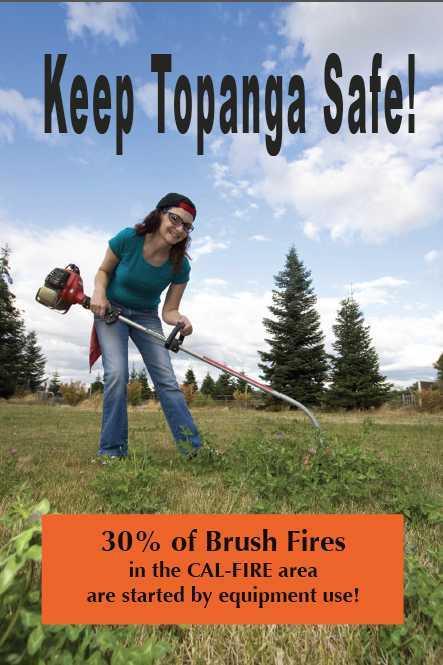 It is important you brush clear your property and create a defensible space around your home to ward off potential fire disasters. Firefighters credit brush clearance with preventing a major loss of homes and other damage during the wildfire. Most brush fires start on uncleared, overgrown areas with lots of fuel (such as dead branches, tree parts and dry leaves), so brush clearance is considered a crucial barrier when flames reach developed areas. Although brush clearance inspections occur one a year, remember that maintenance is a year-round responsibilty. The LA County Fire Code requires all structure owners to comply with brush clearance requirements in an area up to 200' from structures. To help you following safe brush clearing guidelines, please read on. 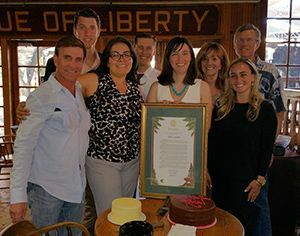 On Saturday, June 6th Senator Fran Pavley (D-Agoura Hills) will recognize Topanga Creek Bicycles as the 27th Senate District’s California Small Business of the Year in a local ceremony. This annual designation is coordinated by the California Small Business Association and honors small businesses in legislative districts throughout California. As an industry-recognized leader, Topanga Creek Bicycles was selected by Senator Pavley for promoting recreational opportunities in the Santa Monica Mountains and encouraging bicycle safety in partnership with local law enforcement. 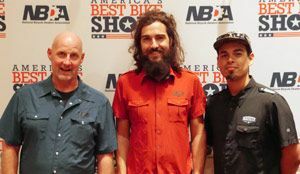 Owner, Christopher Kelly and the employees of Topanga Creek Bicycles will be recognized by Senator Pavley and the California Small Business Association in a ceremony in Sacramento on Wednesday, June 10, 2015. Topanga salutes Christopher for his contribution to Topanga and its borders beyond. Project Website - click here. Road work on TCB to begin at or on July 6th, 2015. There will be no road closures, but only temporary single lane closures and access to businesses will be available during construction. North and southbound traffic will alternate during single lane closures. Construction will be limited to the hours of 9am to 3pm, Monday thru Friday to minimize impacts to nearby schools. 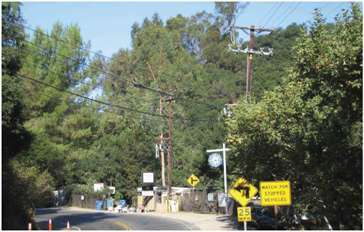 Soil sampling as required by the permit conditions of Caltrans for, among other things, ADL, Elevated Hydrocarbons, has been completed and the findings reviewed and approved by Caltrans. Additional research and reporting has taken place to provide Caltrans with a Health and Safety plan and Excavation and Transportation Plan in support of these findings. Additional training and site preparation has been completed, preparing the civil contractor and their team to be available to start work within the road right of way at or near July 6th. Want to know ways to combat the drought and comply with the water conservation mandate? Then check out the LACWD website. 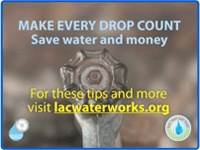 It has helpful information where you can learn about the phased water conservation plan, see drought concerns for 2015, and find water conservation tips and rebate programs. You can also find a native plant list and learn about the new landscape phrase, "Xeriscape". By using water responsibly, Los Angeles County residents can make a huge difference in protecting this resource for future generations. Click here for more information on how you can save water and save money! Watch videos on: Water Supply: Rainbarrels, Water Conservation, Energy Conservation, Rain Gardens: Creating Water Supply At Home and At Work. 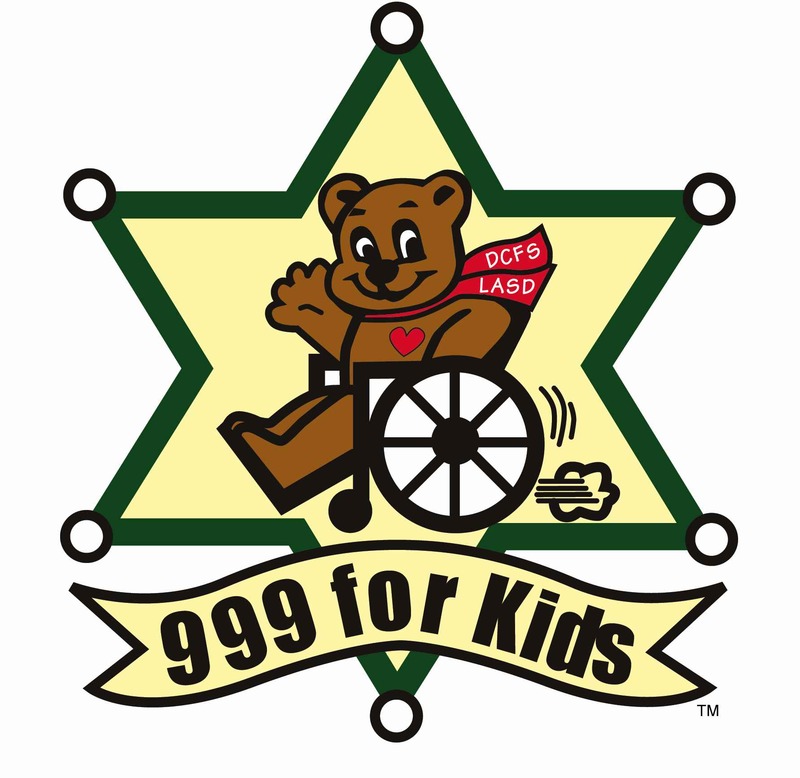 Los Angeles County Sheriff’s – Malibu/Lost Hills Station is asking for your support for this very worthy cause. Thousands of children in Los Angeles County are under the care of or assisted by the Department of Children and Family Services because they have been abused, neglected or have severe mental and physical disabilities that require resources far beyond their families’ capabilities. County funding is not always sufficient to provide the special equipment and services that these children need to enhance their lives. Many of the children must use wheelchairs or cannot interact and communicate without assistance. Kara Seward, District Director of my office in Calabasas, is leaving California after serving my constituents in the 27th Senate District for more than five years. Kara is returning to her home town of Indianapolis, Ind., to be closer to her family. During her time in the district, Kara and her staff helped hundreds of residents of Ventura and Los Angeles counties with concerns and problems, big and small. She's worked closely with local, state, and federal government agencies as well as community and charitable groups. Her goal always has been to make state government programs and benefits understandable and available to the nearly one million people I represent. Ride the bus from the Valley to the Sea and Back Again - Now 7 days a week! Public Works is pleased to provide 2015 Summer Beach Bus service from Topanga Canyon to local beaches and the valley. Passengers can board the Summer Beach Bus through Labor Day, Monday, September 7, 2015. Round trip fares for Children and Adults is $1.00. Seniors and persons with disabilities are .50 cents. This service is sponsored by the County of Los Angeles. Please download the Topanga Brochure for dates, schedule, and bus stop locations. To ensure seating availability, make a reservation here. 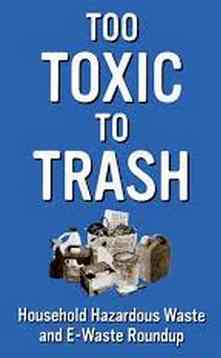 Dispose of household hazardous waste the right way! • Brake fluid, paint*, paint thinner, cleaners with acid or lye, pesticides or herbicides, household batteries and car batteries, pool chemicals, motor oil, oil filters, expired pharmaceuticals, anti-freeze, and fluorescent light bulbs. PaintCare Program. Details at www.PaintCare.org or (855) 724-6809. • Household electronic waste including: Computer monitors, televisions, computer CPUs, keyboards, printers, cell phones, etc.